When the war on terror calls their husbands to duty, five LDS women are left behind to fight battles of their own: Kim, newlywed and pregnant, frightened of what the future might bring. Brenda, struggling to manage three unruly boys and a crippling bout of depression. Jessie, secretly grappling with mixed feelings about her emotionally abusive husband. Marianne, wrestling with a rebellious teenage daughter. And Nora, the seasoned Army wife with perfect hair, an immaculate home — and an ill-tempered mother dying of cancer. Knowing the separation of deployment is extremely difficult, Nora gathers the wives every week to share lunches and burdens. In good company, they worry over safety in the field and stability at home and offer one another counsel and comfort. But as their personal crises build, each woman faces the risks of forming deep bonds of trust. And when tragedy strikes, they must confront the painful realities of war that pull families apart and bring friends together as sisters. When I choose a novel, suspense and romance are always the top requirements. Band of Sisters had neither element. Imagine my surprise when I couldn't put the book down. It is a touching story of five women, who felt like my next-door neighbors, dealing with their husbands' deployment and the awful terror that these men might not come home. It was an honor to be inside this tough band of sisters and catch a glimpse of what life would be like when the person you love and the father of your children is far from home and safety. I recommend this book to anyone who is a wife or mother. It will make you laugh, cry, and truly appreciate how blessed you are and how amazing the families are who serve our country. Sounds like a fantastic book, and I already know Annette is a fantastic writer. I'm looking forward to reading it. I can't wait to read this book. I enjoy Annette so much! Thanks for the review. I became a follower, I am excited to read this book. I just love Annette!!! Plan on doing things for other entries as well!!! Just tweeted it Twitter name babybjo, it will also copy to my facebook also posted at my blog http://b-josbabblings.blogspot.com which will also post to my facebook page eventually! 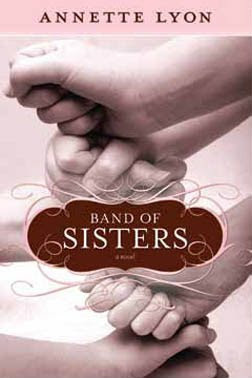 I am so excited about Band of Sisters and can't wait to read it! I have a lot of family that has served overseas and am excited Annette wrote about the women who are left behind while their husbands serve. I just became a follower. I want to read this book. I am an Army wife myself and would love to read about the relationships these women have. Thanks. Thanks for all the comments and entries. Shelly, I would love to hear what you think. It seemed to ring very true for me, but I've only watched a sister-in-law and beloved cousin go through deployment, never experienced it myself. I'm a follower. Enter me in. I'd love to read this book. I love my sisters, blood and otherwise. I love that, Robin, "blood and otherwise." I'm blessed with so many wonderful sisters, couldn't make it without them. Oh, this sounds like an emotionally charged book... Thanks for the review and giveaway! This sounds like a wonderful book! I would love to win/ read this book! It is a very touching book, Heidi. I bet you would love it. I think this sounds like an awesome book that many can feel the love what the women go through. I would love a chance to win, it sounds like a great book. wow, what a wonderful concept for a book; a band of sisters and what they share through tough times; I'm loving it already. Please enter me for the giveaway....sounds like a very good book. Thanks!! !